Wind is caused by temperature and pressure fluctuations in the atmosphere as the sun warms the earth. 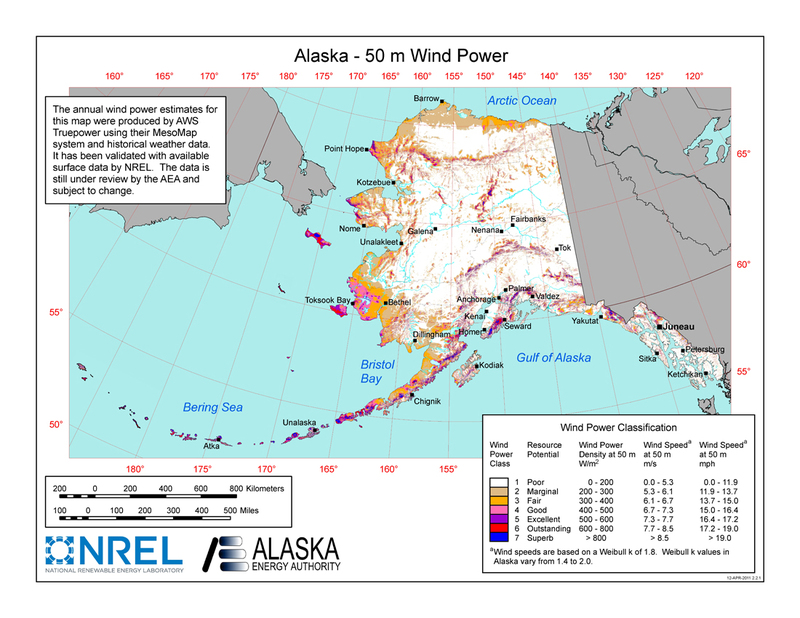 Alaska's wind resources are abundant, especially on the western coastal regions of the state. Wind devices are powered by air. Air moving relative to an object such as the blades of a wind turbine (or the wings of a plane) imparts a force on that object. Wind turbines use this aerodynamic force to convert the kinetic energy of the wind into mechanical energy that can be harnessed for use. The energy in the wind can be defined for a specific unit of area that the wind is flowing through in a unit of time. Wind energy is directly related to the area swept by the turbine blades, air density, and the cube of wind speed. A doubling of the wind speed increases the power from the wind by eight times. For this reason, the most important factor in calculating wind power is determining wind speed. This fact is important when considering the integration of wind into existing power systems. In most instances we need our power to be constant, and wind energy is as variable as the blowing wind. A wind turbine generator (WTG) uses a wind turbine rotor, with turbine blades to transform wind energy into mechanical energy; and a generator, to transforms that mechanical energy into electrical energy. Many different types of wind turbines are available. Sizes vary. 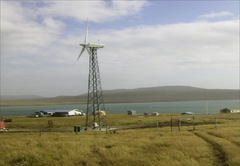 Small (10 kW or less) wind turbines which are typically used for individual homes or small businesses. Medium-sized (50kW - 1000kW) ones are used for remote communities and other grid-connected, distributed generation. Large turbines (1MW or more) are generally used in large wind farms. This section focuses on medium and large wind turbines without addressing the application of small wind turbines. More information on small wind turbine applications can be found on the Wind Powering America small wind website, or the Alaska Energy Authority website. Various publications like Wind Power: Renewable Energy for Home, Farm, and Business, by Paul Gipe (2004), might also be helpful. Obvious opportunities exist, but there are environmental and technical challenges related to the deployment of wind devices in Alaska. Some of these challenges are common to installations in any location, while others are more specific to Alaska. Most environmental concerns relate to potential impacts on birds. Often, coastal regions with good wind resources also have strong bird populations, including the King Eider, Black Scoter, and the Steller’s Eider, which is an endangered species. Two general laws govern turbine impacts on birds, the Endangered Species Act and the Migratory Bird Treaty Act. At this point there is a limited amount data on the impacts of Alaska’s current wind projects on local species and population. Survivability and performance of turbines in the Arctic is another consideration. Wind turbine performance in Alaska has been good, however there is relatively limited information due to the small number of installed wind systems. Additionally there is little in-state maintenance support for most wind turbines at this time, however, with the continued growth of wind power in Alaska, this expertise is being developed. Some areas of Alaska are also subject to substantial amounts of rime icing and extremely low temperatures, these conditions may have a significant impact on wind turbine performance and reliability. Challenges still exist with the integration of wind technologies into new or existing diesel power plants. Combined systems can be complex, and care must be taken during the development of the project to insure that the resulting system will perform satisfactorily. Also, the operational complexity of the system changes as the amount of wind energy increases as compared to the load. Although a wind map has been completed for the state, additional local wind assessments are required to justify project development on any meaningful scale. The installation of an anemometer and collection of enough data to understand the local wind resource can take over a year. In rural communities now using diesel generators, it is important to understand that wind energy alone cannot replace diesel generation. In most applications, when the wind is blowing, wind energy is used to reduce dependence on and consumption of diesel fuel. Diesel power is relied on when available wind energy is insufficient. These types of power systems are described in greater detail in the wind-diesel section. Alaska has significant potential for wind technology development throughout the state, but the best resources are concentrated near the coast and on the large coastal plains and river deltas, like the Yukon-Kuskokwim region. Communities in interior Alaska may also have wind resources, but they are generally confined to passes, hills, or ridge tops. In nearly all cases, specific assessments will likely be required. 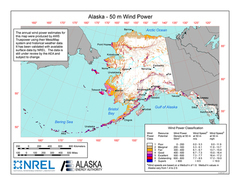 Click on the map image to see an Alaska wind resource map at 50 meters (map courtesy of National Renewable Energy Laboratory (NREL) and Alaska Energy Authority (AEA). To see a list of current wind projects in Alaska, go here. There are many different wind turbine designs, but all of them have things in common. The main component that transforms the wind energy into mechanical energy is the rotor, which includes the blades. Based on this commonality, wind turbines are classified by the structure of the rotor and its location in the airflow. The two main types of wind turbine are horizontal axis and vertical axis, referring to the axis of the blade rotation. At this time, the only type of configuration commercially available for medium and large installations is the horizontal axis turbine, so it is the only one considered here. The rotor of a horizontal axis wind turbine rotates around a horizontal axis, parallel to the wind direction. The blades of the rotor are arranged rigidly in a plane, that is always oriented perpendicular to the wind. These turbines generally have an enclosed part or nacelle that houses all of the wind turbine’s mechanical infrastructure such as the generator, gearbox, break, and power electronics. While most smaller wind turbines have a tail, tails are not common on larger turbines. All horizontal axis wind turbines are mounted on top of a tower, which is either tubular or lattice frame in design. Potentially available to communities in all regions of Alaska although generally focused in coastal areas and throughout low-lying delta plains. At least 134 rural communities have viable wind resource. Additional communities along the Railbelt have yet to be assessed. Wind-diesel systems are commercial to early-commercial depending on level of wind penetration to existing load. Larger turbines appropriate for the Railbelt are fully commercial. Impacts on local and migratory bird populations although little impact currently documented. Potential for noise and visual impacts when sited close to a community. Most impacts can be minimized by appropriate siting, design, and operation. Wide disparity on payback. For rural areas payback is highly dependent on associated balance of system costs and price of offset diesel fuel. For any location with a known wind resource, there are several factors that can be used to predict electrical generation from a wind turbine. The most important include the power curve, the cut-in wind speed, the rated wind speed and power output, and the cut-out wind speed. These factors along with turbine availability all contribute to the capacity factor of a turbine. All of these terms are explained in more details as follows. The main way to assess the performance of a wind turbine is through the examination of a wind turbine power curve. On the vertical axis, the power curve depicts the expected electrical output of the turbine, at specific wind speeds, which are shown on the horizontal axis. Wind turbine power curves can be calculated either based on the design of the turbine, or measured from actual turbine operation. For smaller permanent magnet generators it is especially important to get a measured power curve from a manufacturer since this curve can be different from the calculated version. Furthermore, a power curve is not universally valid. It depends on turbulence, atmospheric pressure, and ambient temperature at the measuring location. A power curve is usually corrected to sea level and 68°F ambient temperature. The lowest wind speed at which the turbine will generate power is called the cut-in wind speed. Although at face value this parameter should be clear, there are several nuances. Because of the mass of the rotor, a spinning turbine will produce power at a lower wind speed than a turbine starting from a standstill. If the power curve is calculated based on the properties of the turbine, the cut-in wind speed tends to be lower, as it does not account for the rotational mass of the rotor. A low cut-in wind speed is generally desired, since this translates to more time when the turbine is producing at least some power. Cut-out wind speed defines the speed at which the wind turbine is designed to be shut down to prevent damage to the wind turbine. The wind speed is usually monitored by the turbine control system, and if the cut-out wind speed is reached, the turbine breaking system is applied and the turbine will not operate. Typical cut-out wind speeds are around 25 m/s (56 mph). By over-sizing specific components, wind turbines can be designed to have higher cutout wind speeds. Small wind turbines with furling mechanisms do not have a cut-out wind speed. Instead, as the wind speed increases, the furling mechanism engages, turning the turbine rotor out of the wind, and thus reducing the turbine strain and power output. The rated wind speed and output power are relative values that give an indication of wind speeds required for the turbine to produce large amounts of power. If the rated wind speed for the turbine is much higher than the typical wind speed for the site, it is probably not a good turbine to use. There will be little time when the turbine is producing significant amounts of power. Usually, a generator with lower rated wind speed is better than a similar one with a higher rated wind speed. This is because the turbine with a lower-rated wind-speed will reach fall rated output under more likely wind speeds. The survival wind speed is the maximum wind speed that the wind turbine is designed to withstand safely. Most wind turbines have a specified survival wind speed of 50 m/s - 65 m/s (112 mph - 145 mph), and in many cases this value is regulated by national standards. Wind turbines can also be specified to have higher survival wind speeds for installations in unusual or special environments. Small wind turbines with furling mechanisms will still be generating power up to the survival wind speed, while non-furling turbines will not be operating at wind speeds higher than the cut-out wind speed. The survival wind speed is really more of an insurance or a safety consideration, as wind turbines typically do not suffer any damage from winds higher than the stated survival speeds. Availability describes the amount of time that a wind turbine is ready to produce energy. It is defined as the ratio between the number of hours the wind turbine operates divided by the number of windy hours over the same time period. A high availability describes a turbine that is producing power whenever the wind is blowing. Availability is a term used to describe the operational and maintenance condition of the wind turbine. In modern wind turbines, availabilities over 95% are expected. For small wind turbines, availability over 99% is not unusual. Wind turbine capacity factor describes the amount of energy that the wind turbine produces compared with theoretical production if it were running at full, rated power. The capacity factor is reported over a fixed time period, usually a month or a year, and is calculated by dividing the turbine’s energy production over that time by the energy production if the turbine were running at rated power over the same time period. Capacity factor describes the power production expectations of the wind turbine. It is most strongly related to the wind resource at the site. Capacity factors of 25%-40% are typical, while values up to 60% have been reported. As would be expected with any power generation technology, not all wind turbines are created equal. Additionally, specific design features make some turbines more appropriate for remote or Alaskan installations. One of the primary problems with wind turbines installed in rural Alaska during the 1980s, is that little thought was given to appropriate application of the turbines or the long-term sustainability of the projects. The International Electrotechnical Commission (IEC), an international standards development organization, has developed a classification system for wind turbine systems. It specifies the design conditions for particular wind turbines. Class I, II, and III specify the design wind speeds for a specific turbine product. Manufacturers who are certifying wind turbines must pick one of these classes. Class I turbines are designed to operate in the harshest climates, with strong annual average wind speeds and turbulent wind. Class II turbines are designed for most typical sites and Class III turbines are designed for low wind resource sites. Typically Class II and III turbines have a larger turbine rotor (longer blades) to capture more of the wind energy at lower wind speeds. They may look more appealing from an energy capture point of view, even at high wind speed sites; but this should not encourage people to install higher class turbines for lower class sites. The class of wind turbine should be selected based on the conditions at a particular site. The IEC has also developed standards for many other parameters, such as power performance, noise, and electrical characteristics. Most large wind turbines have been certified to IEC standards; however, this is not as common for medium wind turbines, due in large part to the cost. Turbine Class and certification should be considered when selecting a turbine. Interconnecting a wind turbine into a remote or weak grid network can be complicated, and specific wind turbine design characteristics play a key role in determining just how hard the job will be. Traditional wind turbines with a synchronous generator, stall regulated control, and no power electronics can cause large power spikes and/or power variability depending on the wind conditions or during start-up. Turbines using synchronous generators but active pitch control allow better or smoother power quality. Variable speed wind turbine technology with active pitch control can actually allow the control system to specify a desired power output from the turbine, as opposed to being limited to accepting whatever energy the turbine produces. Additional devices may also be purchased to smooth out power fluctuations from the wind turbines, such as capacitor banks, turbine soft starts, and variable motor drives. In any case, the turbine selection process should consider the level of turbine and power quality control depending on the application and system requirements. A multitude of other selection or design criteria should also be considered when determining the turbine model for a particular application. Turbine weight and installation height will be determined by the equipment available to move and install the turbine. Tower type (lattice or tubular, tilt-up or crane-installed) will depend on the site conditions and manufacturer’s options. Some turbine manufacturers have cold weather packages that allow turbines to operate at lower temperatures and in icing conditions. Finally, there are applications where it makes sense to install an older turbine, which may have lower performance and limited control options, but which can be maintained more easily in rural areas rather than to purchase a modern turbine, which will have better specific performance and advanced control, but may be more difficult and costly to service. Alaska Wind-Diesel Applications Center. The Alaska Center for Energy and Power (ACEP) at the University of Alaska has developed a Wind-Diesel Applications Center. This Center represents a partnership between ACEP, AEA, several other state organizations involved in wind-diesel technologies, and NREL. The Center’s mission is to advance technology in wind energy and wind-diesel integration for the benefit of Alaskans. Renewable Energy Alaska Project (REAP) has created a Community Wind Toolkit as a guide for those looking to begin wind energy projects in rural Alaska.